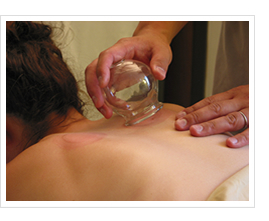 Cupping is a method of treating disease by releasing local congestion. A partial vacuum is created in glass jars or plastic cups, usually by means of heat or a suction device, which are applied to the skin, drawing up the underlying tissues and pulling the fluids to the surface, thus removing underlining stasis which increases blood flow and nourishment to the injured area. 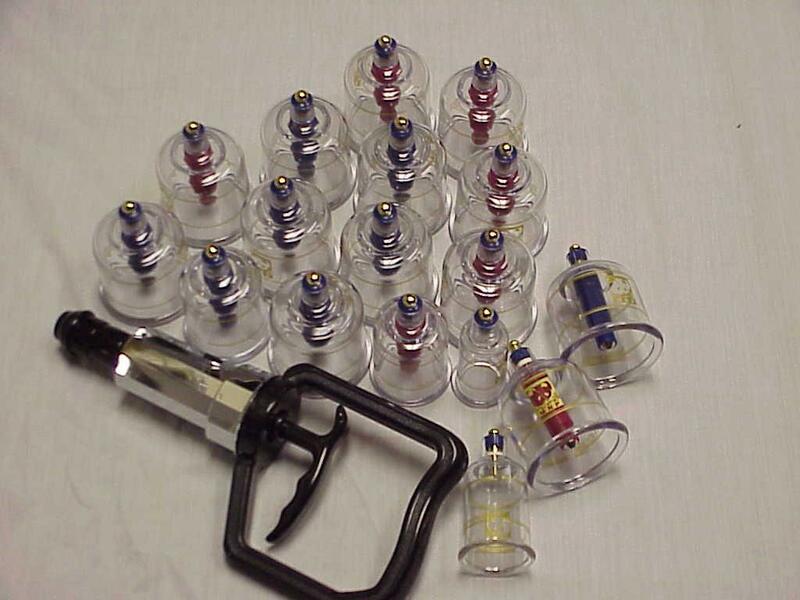 Application: Cupping is used to treat wind-damp impediment (bi) pain, colds, phlegm-rheum, cough and panting; stomach pain, abdominal pain, back and lumbar pain, leg qi pain; initial-stage welling-abscess (yong) and flat-abscess (ju). Individual forms of cupping include STATIONARY CUPPING, PUSH or RUNNING-CUPPING, FLASH-CUPPING, and PRICKING AND CUPPING. In ancient times, animal horns were used, principally in draining postulated sores. Later this method was utilized in treating consumptive and rheumatic diseases. Originally, cups were made of bamboo, ceramic, iron and brass cups have developed. Today, cups made of glass, bamboo and plastic. They are available in many sizes, and selected according to the skin surface and method of treatment. Both the range of indications and the variety of instruments has grown since their inception. Gua Sha is a straightforward technique commonly used in Asia by practitioners of Traditional Medicine, in both the clinical setting and in homes. In Gua Sha, the skin is pressured, in strokes, by a round-edged instrument; this, in Western terms, extravagates blood and metabolic waste congesting the surface tissues and muscles, promoting normal circulation and metabolic processes. By resolving fluid and blood stasis, Gua Sha is valuable in the treatment of chronic or acute pain, in the prevention and treatment of acute infectious illness, upper respiratory and digestive problems, and many acute or chronic disorders. Like Cupping it may not look good but when used appropriately is can really speed of the healing process.